Maple Syrup is an natural sweetener obtained from the sap of maple trees. It comes in different varieties and grades, from light golden color to a darker amber. It is a syrup made that up mainly of sucrose and water, with some minerals and vitamins. It is about as sweet as ordinary sugar and is usually in a liquid state that has a lower viscosity than honey. It can also be made into maple sugar. It can be used as a sweetener on its own or as an ingredient in cooking. It is often used with pancakes. It's glycemic index is about 54, slightly lower than sugar. It is only used as a sweetener. Unlike honey it does not have medicinal or anti bacterial qualities. Nevertheless it has an excellent unique flavour which makes it useful for glazing meats, as an ingredient in sauces and in various recipes. Nothing tastes as good on pancakes! Makes nice ice cream as well. The granulated version can be used as a table top sweetener and it has a slightly lower glycemic index than ordinary sugar, though not as low as coconut palm sugar. It is a natural unprocessed product. Unlike refined sugar no chemicals are used in its manufacturing. It can have an excellent flavor and is very useful in cooking. It is a very good source of certain minerals including magnesium, manganese, potassium and zinc. it also contains B vitamins. It is mostly sugar and water. Therefore, if taken in excess, it can cause all of the same problems as sugar, i.e. tooth decay, diabetes, and obesity. For this reason it should be counted as part of the daily intake of refined sugar, and moderation exercised. The World Health Organization recommend no more than 50gm refined sugar per day (about 12 small teaspoons) for an average adult and are considering reducing this to 25gm. This would apply to all sugars including maple syrup. It is a natural product sourced from maple trees. A hole is drilled into the tree and a tap inserted to allow the sap to flow. This is collected in a bucket, or sometimes with tubes connected to a container or pouch. The liquid obtained is mostly water and must be boiled down to produce the syrup. No chemicals or enzymes are used in the process, it is a totally natural product. Different grades of maple syrup or maple sugar. It's pretty expensive for the genuine article! It's about 15 times the price of sugar by volume. It's market share as a sweetener is low. 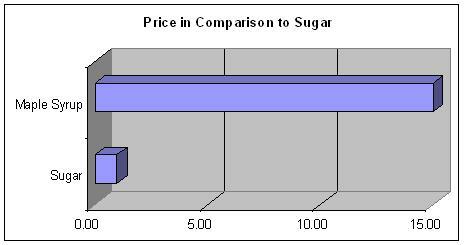 Annual production is about 0.035 million tons per annum or about 5,000 times less than the market share of sugar. The native American Indians discovered it and showed the early settlers how to extract it. Canada is by far the biggest producer in the world, most of it coming from the province of Quebec. There are many imitation products on the market, these are often served in restaurants. They are usually made out of high fructose corn syrup with coloring and Fenugreek spice added which gives a very similar flavor. They are much cheaper than the genuine article but are probably best avoided. It is a natural product and is fine in moderation. However it is just another form of sugar and is high in sucrose. Care needs to be taken to avoid excessive consumption. Not suitable for diabetics. Should be used in place of, not in addition to, ordinary sugar. Does not have the medicinal or antiseptic qualities of honey.